The Russell House hotel was the most high-profile hotel in Ottawa, Ontario, Canada for many decades. It was located at the corner of Sparks Street and Elgin Street, where Confederation Square is located today. The original building was built in the 1840s. Additions were made in the 1870s and the original building replaced in 1880. It closed in 1925 and was demolished in 1928. The Second Empire hotel was located at the southeast corner of Sparks Street and Elgin Street. A small hotel was first built there in the 1840s and was named Campbell's Hotel after its proprietor. In 1863, it came under the ownership of James Gouin, who named it the Russell House after a family in the United States he managed a hotel for, in Quebec City. Gouin later built the Caledonia Springs Hotel, a famous spa in eastern Ontario, and was appointed Ottawa Postmaster by Sir John A. Macdonald. Ottawa's status as the capital of the new country created a pressing demand for hotel space. A new wing housing the dining room was built during the 1870s along Elgin Street. The original hotel was torn down and replaced in 1880, in the "Second Empire" style. For many decades the Russell House served as Ottawa's foremost hotel. Most Canadian politicians from this era spent time at the Russell House, and Wilfrid Laurier lived there for ten years before moving to Laurier House. International guests included Oscar Wilde and Anna Pavlova. On two occasions, important sport-related events occurred at the Russell House. In 1876, Ottawa's first rugby football team, the "Ottawas", was organized at Russell House, and play its first game three days later. The club would evolve to become the Ottawa Rough Riders football club. In 1892, at a dinner at the Russell House to honor the Ottawa Hockey Club, Governor-General Lord Stanley announced he would offer a trophy to the top Canadian ice hockey team, the genesis of the Stanley Cup. In 1912, the Château Laurier succeeded the Russell as Ottawa's premier hotel. Money was spent on renovations in the 1920s, but the hotel had declined due to age and its closure was announced on September 1, 1925. Some of the reasons listed were the high cost of heating the structure, and the higher number of staff to operate the hotel, compared to a newer facility. The Russell House closed permanently on October 1, 1925. Ground-level shops remained open, but the hotel was emptied. On April 14, 1928, a fire broke out in the hotel, and the hotel was mostly destroyed. The remains of the structure were demolished by November. The Government of Canada had been in the process of buying the property when the fire occurred, and the government used the land to expand Elgin Street to create Confederation Square. Various artifacts of the hotel are on display at the Bytown Museum. Confederation Square, square containing War Memorial has history of area with Russell Hotel highlights. ^ "Plate 33". National Archives Canada. ^ a b Powell, James. "The Russell House Hotel". Today In Ottawa History. ^ Gordon, Charles (January 4, 2000). "Old realities in a new decade 1900-1909". The Ottawa Citizen. Ottawa. p. 1. ^ Denis Larionov & Alexander Zhulin. "Read the ebook Landmarks of Canada. What art has done for Canadian history; a guide to the J. Ross Robertson historical collection in the Public reference library, Toronto, Canada. This catalogue of the Toronto Public Libraries". Ebooksread.com. Retrieved October 10, 2011. ^ Atherton, Tony (February 5, 2005). 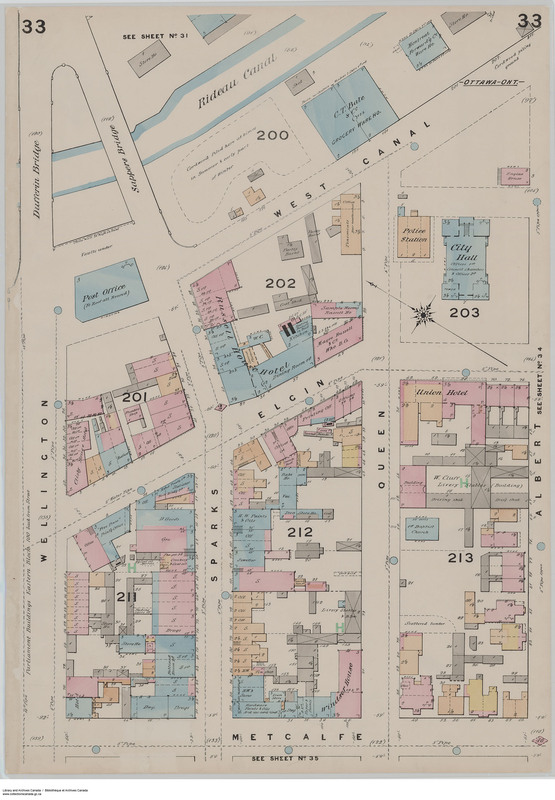 "Ottawa's Shoebox Part 2: The City In Frenzy (1880-1904)". Ottawa Citizen. p. B4. ^ Boswell, Randy. "Ottawa's got game". Ottawa Citizen. Retrieved December 18, 2017. ^ "Accomodation [sic] To Be Acute Problem". Ottawa Citizen. September 2, 1925. p. 4. The Chateau Aeroport-Mirabel is an abandoned resort themed hotel at the Mirabel International Airport in Mirabel, Quebec, Canada. It is located next to where the airport's passenger terminal building formerly stood, and was connected to it via a skyway (still left standing). The hotel closed in 2002. 89 Chestnut Residence is a university residence operated by the University of Toronto, opposite the Metropolitan Hotel at 89 Chestnut Street. It was converted from the Colony Hotel in 2004 and turned into a student residence to accommodate the incoming double cohort in 2003 and 2004. It is located in downtown Toronto. The building was originally constructed as a Motel 11 by the firm Armstrong and Molesworth, a discontinued brand of motels. When it opened in at the Holiday Inn Downtown 1972 it was the fourth largest hotel in the city, with 749 rooms. It cost some $18 million to build and was built on the site of many small buildings of what was then the centre of Toronto's First Chinatown. The hotel was purchased by Hong Kong investor Sally Aw for $73 million in 1989 and renamed the Colony Hotel. The hotel was later partly owned by Aw's listed company Sing Tao Holdings, via Singdeer Joint Ventures. Aw sold Singtao Holdings in 1999. The university purchased the hotel for C$67.6 million in 2003 from Global China Group Holdings (the new owner of ex-Sing Tao Holdings' media business) and other owner of the joint venture, at the height of a downturn in Toronto's hotel industry. Prior to buying the hotel the University of Toronto had rented space to house 400 students at the Primrose Hotel at Jarvis and Carlton.It has nearly 1000 residents from the University of Toronto and the Ontario College of Art and Design University. Until September 2008, it also accepted new applicants attending George Brown College and Ryerson University.It has a conference centre and a revolving room on the 27th floor (opened as La Ronde restaurant in 1972 and now student lounge called The Lookout). It is the most expensive residence of all University of Toronto residences and has a reputation of providing luxurious accommodation and food. The university retained the hotel chef after purchasing it. Chestnut is also home to a larger number of international students than any other residence.The Chestnut Residence Council is the student governing body for social, athletic and community affairs of the Residence. It organizes activities such as: the annual Chestnut semi-formal, coffee houses and open mic nights, ski and snowboarding trips, and intramural sports tournaments. The Duke LIVE is a restaurant/pub that was a 19th-century inn in Toronto, Ontario located at 1225 Queen Street East. Originally known as "The Duke of York," the building served as an inn with a restaurant/pub on the main floor. The inn no longer operates, but the restaurant and bar is still in business. For many years a mural of John Wayne was painted on the wall of the first floor of the building's exterior. The original name of this first location is likely for the Duke of York at the time, Prince Frederick, Duke of York and Albany. The Empress Hotel was a three-storey red-brick building at the corner of Yonge and Gould streets, in downtown Toronto, that was destroyed by fire on January 3, 2011. The hotel was opened in 1888. The hotel changed hands several times. The property ceased operating as a hotel in the mid-1970s. First known as the "City Tavern," kept by Robert Tesseyman, this 19th-century hotel in Montreal, Quebec, Canada, was a popular meeting place of the Beaver Club before later becoming the Exchange Coffee House. In 1805, Samuel Gerrard proposed building Nelson's Column, Montreal here. The hotel was a common place of rest for transient travellers and Upper Canada merchants. It became the location of the first stock transactions in Montreal. The Grand Forks Hotel was a prominent roadhouse during the Klondike Gold Rush, situated near Dawson City in the Yukon region of Canada. The Hotel Vancouver, the second of three by that name, was a 15 story (77m) Italian Renaissance style hotel built in 1916 by the Canadian Pacific Railway (CPR). The architect was Francis S. Swales. The hotel closed in 1939, when an arrangement was made with rival Canadian National Railway (CNR) to jointly operate CNR's new hotel, located two blocks away. That hotel, which took over the name Hotel Vancouver, is still operating today. The 1916 CPR building survived until 1949 when it was demolished by the Eaton's department store chain. Inn on the Park was a luxury hotel which was formerly located on a hill overlooking Leslie Street and Eglinton Avenue in North York, Ontario. It was one of the early Toronto hotels operated by the Four Seasons Hotel chain. Finch Hotel opened in 1848 by John Finch on Lot # 2, Concession # 1 (200 acres (81 ha)), Toronto owned by Thomas Johnson since the late 1790s. The Laurentian Hotel was a 1000-room hotel on Dorchester Street, now René Lévesque Boulevard, in Montreal, Quebec, Canada. The hotel was built in 1948 and demolished in 1978. The building was designed by Charles Davis Goodman, who was the architect of a number of prominent Streamline Moderne structures in the city, including the Jewish General Hospital and Bens De Luxe Delicatessen & Restaurant.At the time, it was the largest hotel ever demolished in Canada. The La Laurentienne Building now stands on the site of the former hotel. Les Cours Mont-Royal is an upscale shopping centre in Downtown Montreal, Quebec, Canada which was converted from the former Mount Royal Hotel. This is a list of defunct hotels in Canada. Lord Simcoe Hotel was one of many of lost hotels in Toronto, Ontario, Canada. Built in 1956, the 20 storey concrete and glass modernist structure was designed by Henry T. Langston and Peter Dickinson. The hotel was named for John Graves Simcoe, Lieutenant Governor of Upper Canada and a resident of York, Upper Canada (now Toronto). The name was somewhat incorrect as Simcoe was never called himself a Lord. Located on the northeast corner of King Street and University Avenue (150 King Street West), it was closed in 1979 and torn down in 1981. It was replaced by the Sun Life Centre East Tower in 1984. The hotel was unable to compete with other downtown hotels due to a lack of central air conditioning and convention space. It consistently lost money over its 24-year existence. Montgomery's Inn is a museum in Etobicoke, Toronto, Ontario, Canada. Built in 1830 as a Georgian-style inn, it was named for its innkeeper, Thomas Montgomery (1790-1877). The inn ceased operations in 1856 and continued as a private farm house that was rented to tenant farmers by the Montgomery family until 1946. It was later owned by a Presbyterian church, a developer, the Etobicoke Historical Society, and the Etobicoke Historical Board, until it was finally transferred to the City of Toronto. Once in danger of demolition, it is a cherished remnant of colonial times in Upper Canada. Though most of its current artefacts are not original to the building, they are period pieces, and a few belonged to the Montgomery family. Rossin House Hotel was a mid-19th Century hotel located at the southeast corner of King Street and York Street in Toronto. The original structure was built in 1856 and was destroyed by a fire and re-built in 1863. It was one of the city's pre-eminent hotels, with one 1866 guide claiming: "What the Fifth Avenue Hotel is to New York, and the Windsor is to Montreal, so the celebrated Rossin House is to Toronto. "The five-storey hotel was renamed the Prince George Hotel in 1909 after the future British monarch. It was demolished in 1969 to make way for architect Mies van der Rohe's Toronto-Dominion Centre, with the corner being further developed in 1984 for The Standard Life Center. Russell's House at Corinthn, Mississippi, salient in the Civil War battle of the Siege of Corinthn. The Edwin is a three-storey building in Toronto, Ontario, Canada operated by WoodGreen Community Services to provide community housing. It incorporates the former New Edwin Hotel, built in 1905 to serve as a hotel for railway passengers coming from a now closed railway station at the foot of the Don Valley. It is located at the intersection of Queen Street East and Carroll Street, east of the Don River, in the Riverside subdistrict of South Riverdale. In 2010 it reopened to provide transitional housing for homeless senior men for a project called "First Step to Home", and was renamed "The Edwin". The Warwick Hotel Toronto was a hotel located at the corner of Dundas Street East and Jarvis Street, in Toronto, Ontario, Canada. It was notable as being the site of significant dance band performances until approximately 1960, after which it became notable as a location for burlesque entertainment. The Windsor Hotel (opened 1878, closed 1981) in Montreal, Quebec, Canada, is often considered to be the first grand hotel in Canada, and for decades billed itself as "the best in all the Dominion".